There's no doubt that our goats enjoy comfrey. I have patches here and there throughout the farm, and Abigail especially is always looking to grab a mouthful as she passes by. 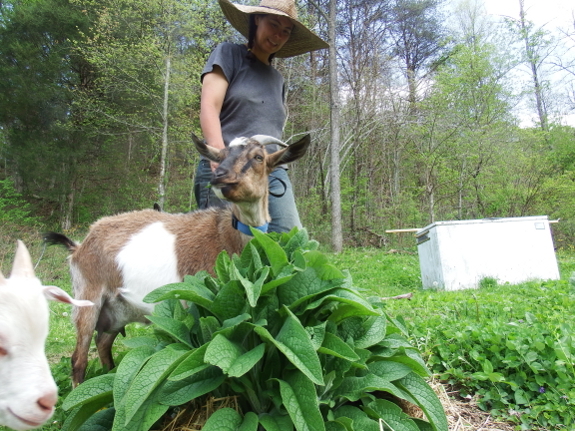 But of my three types --- Common Comfrey, Bocking 4, and Bocking 14 --- which should I most focus on propagating for goats? On a rainy afternoon when tethering didn't seem to be an option, I decided to run a comfrey taste test. 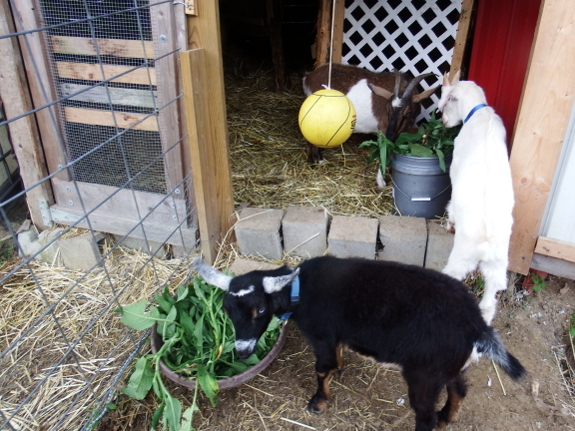 First, I brought the goats a bucketful of Common Comfrey, which they seemed to adore. However, when I came back a couple of hours later, most of the comfrey was still in the bucket. Maybe another variety would be better received? This time, I grabbed a handful of each of the three varieties and presented two handfuls at a time to the goats to try to get a taste preference. Their answer? All comfrey tastes delicious when handfed! They slurped up every leaf of all three types (while continuing to ignore the container of older comfrey leaves at their feet). Would tying bundles of leaves to the fence, so that they can tug and pull them out, be an option? This might be an odd comparison, but I do something similar for our canaries, and also the goslings still in their crate, so that they have the more natural motion of picking off greens with a little resistance. I heard chickens also like comfrey, but mine wouldn't touch it. Which has the most protein & other nutrients? Somewhere in my readings I read that one has more than the others. Also Bocking 14 is not enjoyed by rabbits or chickens as it is too bitter. Guess I'd better check my own newly purchased root cuttings. I feed my goats in their pen on rainy days. I personally don't particularly care very much about what they prefer or not. Every day I tether them in the morning, move them before lunch, and take them back to their pen when I leave for work at 1:00. On rainy days, I just cut as much as the would have grazed and drop it in the manger. If they don't eat it all.... meh. It is the same diet they would have had anyway, they will go out tomorrow as well. My goats aren't kids, if they don't want to eat what I provide, that is their right. But my goats are wethers, not nursing mothers, so that does make a difference I am sure. Treat your goats humanely, love them as pets, but be sure to draw the line somewhere. Feed a leaf through the fence- no problem Stand in rain to feed leaves through fence- big problem. Thank you to everyone for your thoughtful goat and comfrey comments! Eric is totally right --- I probably do baby our goats too much. On the other hand, Abigail's appetite is so prodigious, I assume because of her milk production. And when she moves up from 2 cups a day to 3 cups a day after getting a lot of comfrey, I start getting excited. I posted two comments yesterday (duplicates) which didn't seem to get through. I'll give it a third try. Goats are grazers, just like our chickens. They prefer to take snacks on the move. Which is why I propose you plant comfrey along the footpaths you take with the goats regularly. Makes sure you space them far enough away from the footpath so when they grow, they won't crowd it out. If you have to dig the comfrey up, you might inadvertently spread it into the footpath and then you'll be forever trying to remove it! The benefit of this design though, is the comfrey will stop other plants creeping into the footpath, and you're feeding your goats during your regular routine at the same time. You're not actually having to waste time, hunting for their fodder for them, and they get to eat how they prefer to. They're also helping to maintain the footpath by taking it regularly, and giving the comfrey a trim. Planting your different varieties of comfrey along the footpath will also mean, they take what they want, without you having to decide what they like best. Chris --- I apologize about your disappearing comments! We get a lot of spam, and I occasionally worry that I might miss real comments, which I suspect is what happened to yours. Thanks for persevering and posting again! I inadvertently have followed your advice with planting comfrey along frequently walked aisles. Or, maybe, the comfrey just buffers the goats from the crops so well that the comfrey-lined paths have become the primary goat paths by default. I do like the idea of having an easy way to feed comfrey to goats on rainy days, but the plants definitely won't go to waste even as is. So maybe I'll just expand into aisles rather than along the fencelines, the way I've been doing for the last few years.